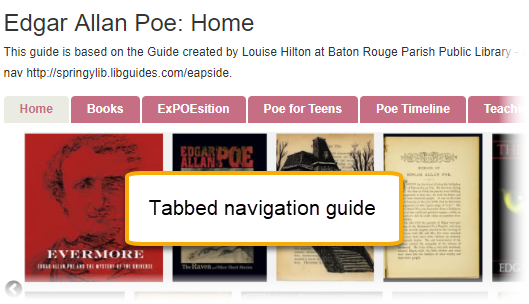 Tabbed navigation: the page navigation will appear as tabs across the top of each page. Each page of a tabbed guide can be customized to have up to 4 content columns of different sizes. 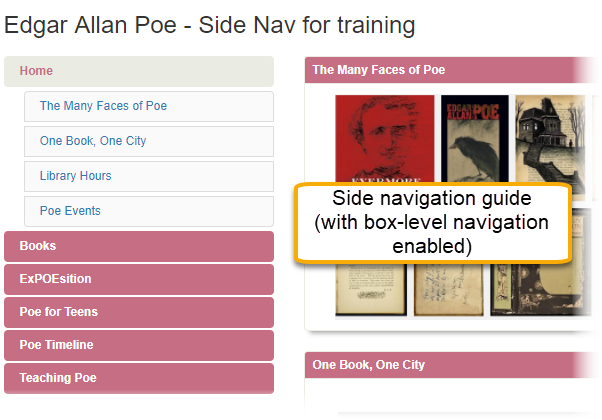 Side navigation (aka side-nav): the page is divided into two columns -- the first containing the page navigation menu, and the second containing the page's content. Unlike a tabbed navigation layout, the number and size of each column cannot be adjusted (unless you create a custom guide page template). If you switch from a tabbed navigation layout with 3 columns to a side navigation layout, the boxes from columns 2 and 3 will be moved to the bottom of column. However, if you switch back to a tabbed navigation layout, all of the boxes would remain in column 1. In both cases, though, don't forget that you can manually reorder the boxes on each page, as needed. Your admin can customize these templates, so you may see a different column layout than described above. If your library is using LibGuides CMS, your Admin can create multiple custom templates you can choose from, in addition to the system defaults. Your admin can force each guide to use the same template. If that's the case for your system, then the option to change your guide's layout will be disabled. 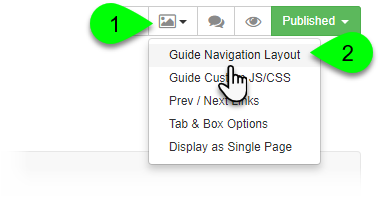 While editing your guide, click on the Guide Layout ( ) button. Select Guide Navigation Layout from the dropdown. From the dropdown menu, select the layout template you want to use. If you'd like to revert back to the system default layout selected by your Admin, select Clear Selection. If you selected a side navigation layout, you can enable a couple of additional options. 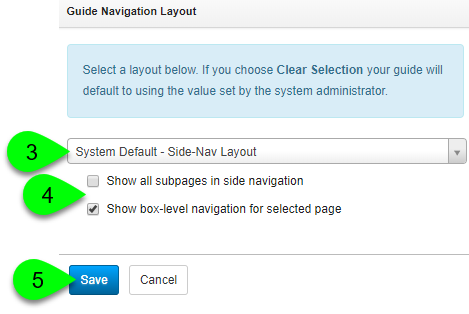 By default, subpages will only display in the navigation menu when viewing their top-level page. However, you can choose to always display them by selecting the checkbox next to Show all subpages in side navigation. When viewing a page, you can choose to display links to each box on the page in the side navigation menu. To enable this, select the checkbox next to Show box-level navigation for select page.